Most of this post was written last year (2017) shortly after filming my scenes for Requiem but hasn’t been posted until today due to my non-disclosure agreement. I appear as Kendrick’s son in episodes four and six. A couple of weeks ago I received a Facebook message from Gillian our local MDUK representative, I was surprised as she had never messaged me before so quickly checked it. She was messaging to say a production company were looking for someone with Duchenne to be an extra in a new show called Requiem and would I be interested! I quickly checked with my PA and Mum, it was due to film in a few days and I wanted to make sure I’d have the care cover needed. As soon as they said yes I replied to Gillian that I would be very interested. I’ve never acted and am not particularly social, but I remember from the time I first watched The X-Files I always wanted to be an extra in a scene, to be part of that magic, I’d never pursued it though as I thought it wouldn’t be practical and who would want me? Gillian passed on my info to Andrew at MDUK head office, but warned me someone else may already have been given the part. Not long afterwards Andrew got in touch with me saying the part was possibly still available and that he’d pass my details on to the production company, New Pictures. I was still concerned I may be too old for the part as there aren’t that many people my age with Duchenne. Someone from the production company then rang and had a long chat with my Mother, I was out unfortunately, but I knew she would be the best to talk to anyway as she’s very chatty and gets on well with most people, age was a slight concern, as I had thought, so I needed to send some recent pictures of myself. Susan the producer emailed me back the next day and seemed happy with how I looked, it’s always nice to be told you look younger than you are, she then checked with the executive producers and I was offered the part! I’m sure most people have to go through a more rigorous process of auditioning and other things, but this was not a talking role so that made everything easier I think. Other than the fact I was looking forward to doing this on a personal level there was also an element of wanting to show disability on television and raising awareness of Duchenne, I think this is starting to get better, but in the past often a “normal” actor would have got a part like this. I knew the company were brave to offer this to me, not just because of showing a “real” disabled person on screen, but also because it entails ensuring I’m safe, booking special equipment etc. There were many emails back and forth after this, Helen the Make up and Hair Designer, Sian the costume designer, Jess the production manager, Rhys the transport manager and Heddi 2nd A.D. Everything was extremely thorough, checking what I’d need and listening to my advice regarding the hiring of equipment, they were all also very friendly, patient and helpful, which was great for a first experience of the industry. I even had contact with Brendan Coyle who would be with me on the day, an amazing, and kind, man who helped me feel right at home. Some of the cast and crew of Requiem with myself at the Requiem première in Cardiff. The filming was delayed by a week or so, which was probably good to be honest as it gave time to ensure everything was in place, it also gave me chance to try travelling on a train again which I had sworn I’d never do again after the last debacle! The day of filming arrived and the train was on time, there was plenty of room to recline my wheelchair on the journey, it was only just over an hour with no swaps so I was still relaxed when we arrived at the station. Andrew from MDUK and Amy from the production team were there to meet us. The one slight hiccup of the day occurred at this point, the taxi was very small and could only just fit my chair in, with the ramp closed it pushed against my ventilator so there was literally no room around me and my head practically touched the roof! My Mum and Andrew had to travel to set in Amy’s car while my PA was in the front of our taxi, not in the back with me. My anxiety did rise rather a lot and had the trip been any longer I’d probably have had to ask the driver to stop so I could have some fresh air. I will say the driver himself was great though, keeping an eye on me in his mirror, slowing for bumps and corners and not rushing. We were greeted at the Requiem set by Heddi and Jess and shown to a large room which had a fridge for my drink to stay nice and cold, no star on the door but you can’t have everything! Amy stayed with us throughout the day making sure we had everything we needed and keeping us relaxed with chat and interesting stories. The medic also came in to check my needs should something happen to me, he gave an air of great confidence and professionalism, he was thorough and should anything have happened I knew would have been in safe hands. We had visits from Helen, Sian, Sue, Jess and Heddi throughout the day, filming was running a little late but I had expected that, it gave more time to prepare though and chat with Brendan too. The set looked brilliant, it was pretty much perfect for what was needed. I then spoke with the director Mahalia, she was very soft spoken, patient and willing to listen, not at all what I’d expected a director to be like! The filming itself went smoothly, we shot two scenes with various camera angles, every shot was done in one take with no mistakes. I had no concept of time while it was going on so couldn’t tell you how long it took, I was just enjoying the experience and trying to do what was asked of me, I was checked on regularly and they sent in my PA in between takes to see if I needed anything, I definitely felt part of the team. After the scenes were done we returned to our room and Mum, my PA and Andrew had a quick meal before the taxi arrived. Luckily they booked two taxis this time as the taxi company sent another small taxi for me, I don’t think Heddi was very happy with the taxi company but there wasn’t a lot she could do at that point. I squeezed in again and headed back to the station during rush hour, in hindsight it would have been worth waiting an extra hour before leaving to avoid the slow traffic and cramped train. Andrew waited with us until the train arrived and made sure we were on safely, it was good having him around during the day as extra support and to chat too. My first experience filming was amazing, I wasn’t nervous and I think I managed to take everything in my stride, I just hope my calmness didn’t make anyone feel I wasn’t happy or not liking it. Talking to everyone was great, and I think part of the reason I was so calm was the friendliness of the crew and how well they did their jobs. I don’t know if I’ll ever have the chance to do something like this again but I would love too, even fairly regularly, I think I may have been bitten by the bug! I also hope to keep in touch with some of the crew such as Heddi who was so helpful and nice to me. 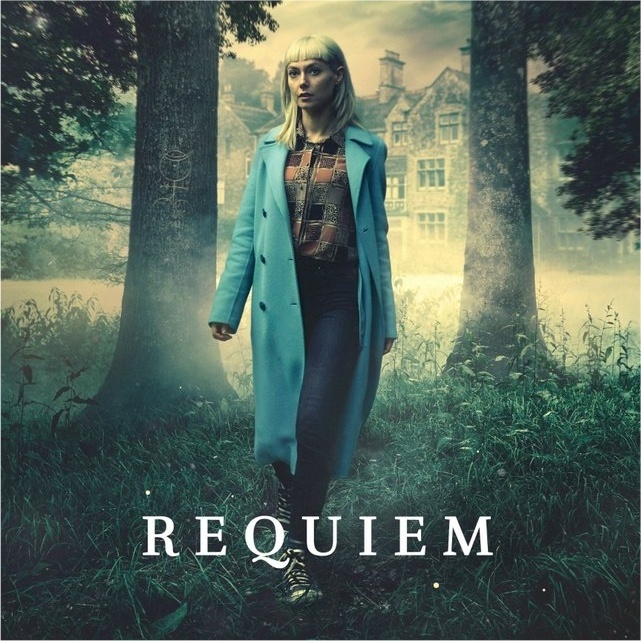 Requiem is a psychological thriller with Supernatural undertones and airs on both the BBC and Netflix. The complete series is available on BBC iPlayer, Netflix will air it worldwide on March 23rd. You can also listen to my interview with Faye Hatcher about Requiem on BBC Radio Gloucestershire (only available for 28 days) For Apple devices install iPlayer radio and search for Faye Hatcher, episode 10/03/2018. Although I didn’t manage to meet Lydia Wilson (Matilda) on the day of filming (she was filming the final scene set in a hospital bathroom on the floor above while I was filming below), I did manage to meet her when I was invited to the Requiem Première in Cardiff, a lovely person too who knew exactly who I was. This entry was posted in Acting and tagged actor, Brendan Coyle, Daniel Baker, Duchenne Muscular Dystrophy, Lydia Wilson, MDUK, Requiem. Bookmark the permalink. Very interesting blog, thanks for writing it Daniel. Looks like an amazing experience, and will definitely catch up on the series as soon as I have a bit of spare Netflix time. Seems like you were a natural! Glad everyone was so nice to work with.